Authors can get better discovery (and sales) for their books when they podcast. Sadly, the tips and tricks on how to do this for low cost or free have been scattered all over the Internet. 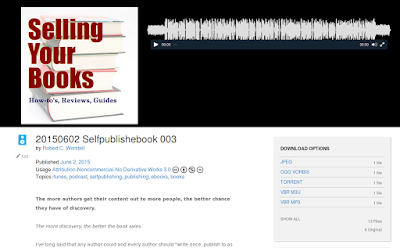 While I have given you a how-to list in my last post, this takes it further – how to get your podcast actually accepted by iTunes and the rest – so you get more exposure and increase your book discovery. You do have have to have a podcast, don’t you? Last post had you creating the podcast, posting it to Archive.org for free hosting, and then burning a feed with Feedburner. All that’s fine on paper, but I had some problems after I though I had it all done. First, a web search brought up this post from Feedburner. That worked just fine as far as steps. That was pretty straight-forward and easy to follow. When you get all their data in place, then submitting it to iTunes is simple and complete. Note: Why iTunes? 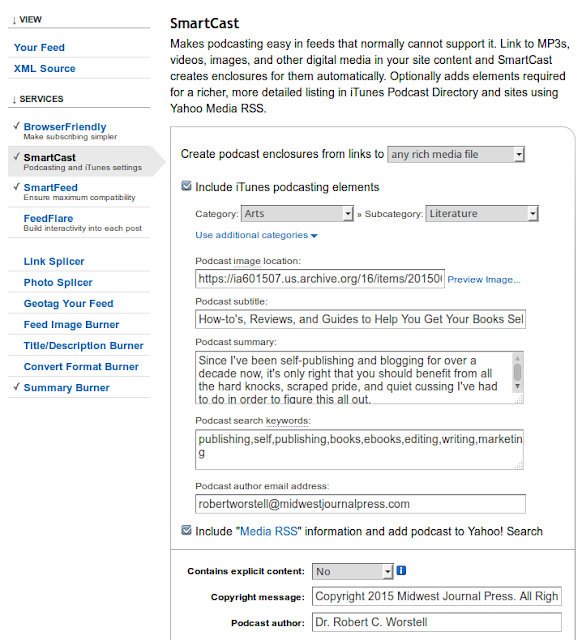 Like Google is for search, and Amazon for ebooks, iTunes is the 900-pound gorilla in the room for podcasting. They are also the most demanding and specific on what you have to reach in order to have a useful feed. That’s the Smartcast tab you’re taken to. Once I thought I’d burned a feed, I went to You go to iTunes’ special link (https://phobos.apple.com/WebObjects/MZFinance.woa/wa/publishPodcast) to submit it. Then I immeditately found it wasn’t accepted – no real explanation why not. So I went back to Feedburner. In the tabs on top, they have a “Troubleshootize” that has some tools to use. I found the bugs on the PodMedic report. One was that I’d failed to actually post a usable Enclosure link for the last podcast – this image shows that it’s now fixed. When I posted the feed to iTunes again, it wasn’t any different – they wouldn’t take the feed at all. Feedburner is really like being in a candy store. There’s tons of stuff to try out and turn on. Problem is, some of them turn other stuff off. So like going to Wal-Mart or any bookstore, you have to put on your blinders and just stick to what you need. This is probably checked already (was for me.) Check it out to ensure it’s just right. This is good to ensure all possible people can see your site. Enable this. Go here to add a personal note to encourage people to visit your actual site. Their default text is a bit stodgy – so write a catchy one about getting your downloadable transcript or some such. That’s about all for Feedburner. The rest are niceties – but some will turn off others. I had to go back and re-enable smartcast at one point. Means just stick to the minimum to get started. Tweaking is for later, a working podcast is what we’re after now. I then resubmitted to iTunes and got the most inscrutable error yet. My podcast image wasn’t accepted. To be eligible for featuring on iTunes Store, a podcast must have 1400 x 1400 pixel cover art in JPG or PNG format using RGB color space. The image URL must end in “.jpg”, “.jpeg” or “.png” and the server hosting the image must allow HTTP HEAD requests. After I converted to jpg format and resubmitted the file, I still had the same error. The first half of that error said my size might be off, but that’s now fixed for sure. The latter part had me stumped: what the hell was an HTTP HEAD request? Some searching gave me a bunch of technical details, but after I tried multiple places with no luck (hosting the image on Blogger itself, and then trying my own domain webhost) – I finally found as a subtle hint in that “Audacity to Podcast” post above, where he said archive.org itself has long been compliant. I just had to right click the image to get the Image URL – but it’s also there on the side, as one of the “Download Options” files for that podcast. 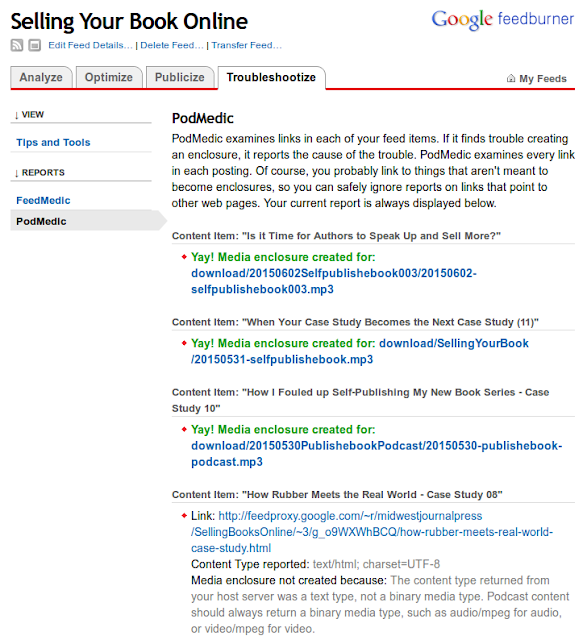 Taking that link and going back to Feedburner’s SmartCast page, and enter it under their “Podcast image location” form spot. This finally solved it. Apple accepted it and I’m waiting on confirmation that it’s live. At least they didn’t accept it when I tried to re-submit (it was “already submitted”). But the artwork showed up on iTunes when I used “Subscribe to Podcast” to add a personal feed. So I know it’s fine. Distribution to other podcast directories. Still, I can’t find that podcast anywhere. Weird, I know. As soon as this shows up anywhere, I’ll let you know. (It’s like the old days of ebook publishing where it took days to go “live.”) For now, you can subscribe by taking the RSS feed and plugging it into iTunes or your favorite “podcatcher”. 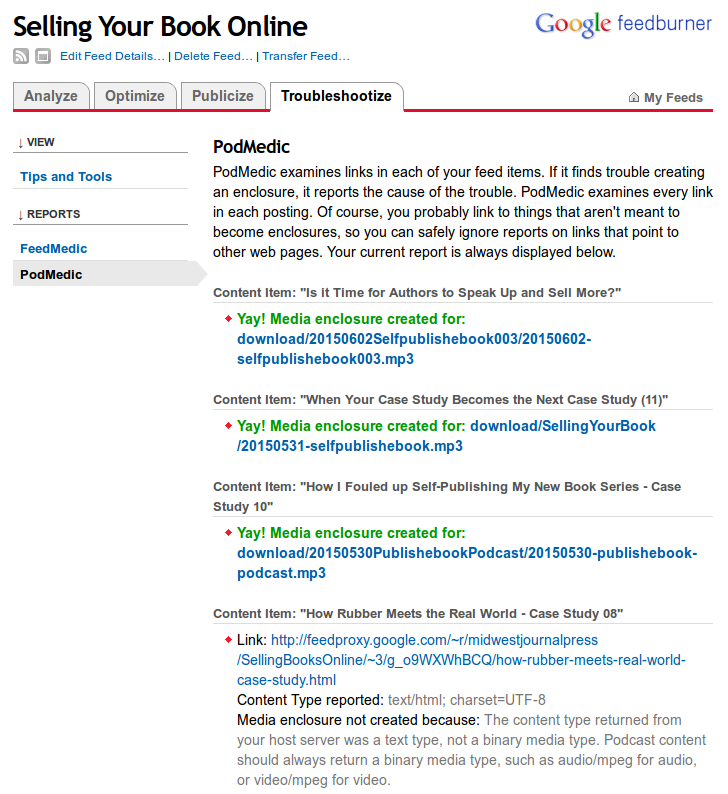 Or, you can download the individual podcasts from the embedded Archive.org player. Update: I received an email when the feed was first submitted that the podcast feed was successfully added. The next day, I received and email that the feed was approved and it’s located at: https://itunes.apple.com/us/podcast/selling-your-book-online/id1001406201 Even without a MAC, you can go to that link and see it. Congrats – I’m published. See how easy it is? Which brings up: Why are we doing this, anyway? If you review those links on the last “blogcast”, you’ll see that they say it’s pretty much the same as book publishing – you have to do a lot and submit to a lot of places to get any traction. Main thing I’m after now is to work out ways to add value, which these audio files also create. Since I’m adding the PDF transcripts (those slideshare embeds) this also enables more stuff to upload to bundles for promotion or sale. Right now, the strategy is to simply carry on. Since I’ve been blogging several times a week, just adding the podcast should help out – it’s distribution on automatic again. I may search to find additional places to submit this podcast feed – but the next target really should be video. That is its own animal, as I’m dealing with satellite broadband issues here in rural Missouri. 1. Write your blog just as if you’re talking to someone. 2. Record and edit your blog post in Audacity. 3. Upload to Archive.org for hosting. Embed their player on your blog post. 4. Create a Podcast image in GIMP and upload that jpeg to Archive.org as well. 5. Add the podcast link from Archive.org as an “enclosure link” on your blog. 6. Create a PDF by scraping the blog, editing it in LibreOffice, exporting it to PDF, and uploading to Slideshare – then embed that file on your blog post as well. 7. Repeat 1-6 until you have at least three podcasts. 9. Submit to Itunes, Stitcher, MiroGuide, Blubrry, and LibSyn. 10. Keep cranking out blog posts, podcasts, and transcripts from here on out. 11. Under Feedburner’s “Publicize” tab – in addition to activating Ping Shot (which boosts your pings so the search engine bots can find your stuff faster) and Socialize (which sends out tweets automatically for every episode) – also click on Chicklet Chooser so you can get the code to update your RSS feed for the site. 12. But that’s not all, folks… For Blogger, go to your blog settings and ensure that you are redirecting your Feedburner feed to replace your default RSS feed. That tidies up all sorts of things. Search engines love RSS feeds, especially from active blogs. The whole point is to make your publishing efforts pay for themselves as you go – with no unneccessary expenses upfront. At this point, the only things you are paying for is that microphone (one-time purchase) and a domain name with minimal hosting costs. Everything else is sweat equity. You may note, and it’s worth repeating – while we use Blogger for hosting, we have a different name for it, which is a subdomain (like: subdomain.domain.com) of your main doman name. Google’s blogger does the free hosting so that you don’t have to mess with the backend problems. You can simply concentrate on churning out content. Hosting on WordPress.com is similar – but it’s way more expensive. They take care of the backend so you don’t have to. In both cases, you are limited to what you can do. (This is why I’ll be porting everything over to Rainmaker platform soon. They built a tool that does everything they need from it. You pay a fee monthly, but get access to the same tools they use for their multi-million dollar content business. Rainmaker also has podcasting support built in, as well as Memberships, and even full-blown courses. They are adding more tools all the time – and you get access to their Authority library of ebooks, seminars, webinars and – yes – podcasts. You can make all the money you can on Blogger. Again – run a lean publishing business where your time isn’t sucked up by bad time investments. Spend your time or writing, editing, and publishing – oh, and some realistic marketing as we’ve started covering here. Work smart, not hard – and buy only those tools or services which a) pay for themselves, and b) free up your time for even more profitable investments. What does this now inspire? 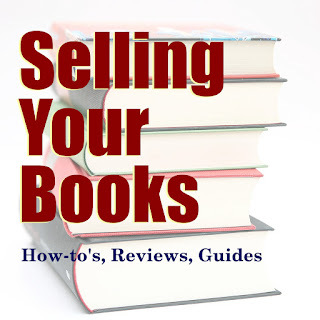 The point of these podcasts is to talk directly to the people who are (or will be) most interested in buying your books. To be fair, we need to complete this work on our Case Study. Podcasting is perfect for storytelling – and so we haven’t strayed far from where we wanted to wind up – which is creating a tool set so people can learn to produce children’s stories. Hope you’re learning from my mistakes and having a more streamlined promotion scene. Do opt-in to keep updated by email, so you don’t miss any of these ongoing adventures. If you’ve found this podcast by iTunes or somewhere else, please leave a comment or other sign wherever you found it. Thanks.